The exhibition has now opened and is most definitely worth a visit. 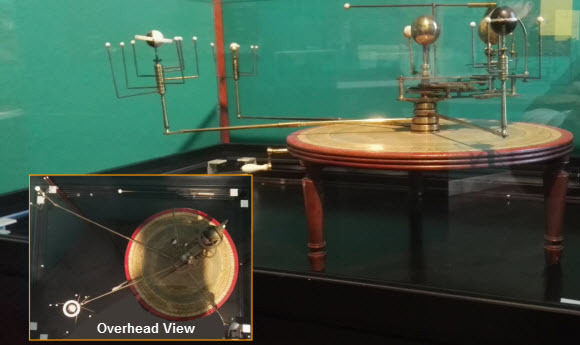 Sponsored by the Royal Society, the exhibition showcases the area’s connections investigating the cosmos, from Captain Cook’s 1768 voyage observing the transit of Venus to the search for Dark Matter at Boulby Underground Laboratory. The exhibition runs until early July. Mark and Phil were fortunate enough to be present at the opening night. After drinks and delicious nibbles, the exhibition was formally opened, before we were invited to preview the exhibition itself. This is first class, very professional looking, with some fantastic exhibits and plenty of explanatory text and picture boards to peruse at leisure. 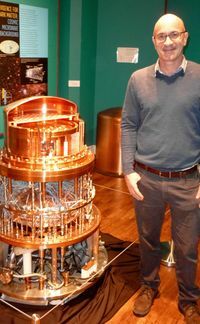 The undoubted star of the show (apart from the societies corner ) is the Zeplin 3 detector, which has been donated by the Dark Matter research team, and has been cut away to reveal the inner workings – all polished copper, photo couplers, and leads – it looks more like a work of art than a device to detect WIMPS from outer space! And to think the whole lot was entombed in lead. and scintillation gives a definititve indication of whether a WIMP (hence dark matter) has been found. A lecture was then given in the Normanby room by Professor Henrique Araujo of Imperial College London. “The Search for Dark Matter”, highlighted the internationally important work carried out at Boulby Underground Laboratory, and how the expertise of the various researchers is helping other Dark Matter labs in their research. Although for the time being, the hunt for WIMPS has now ceased at the Boulby facility, it is nevertheless continuing on at pace in numerous other sites across the globe, in particular at the Sanford Underground Research Facility (SURF) in the Homestake mine – Lead, South Dakota. 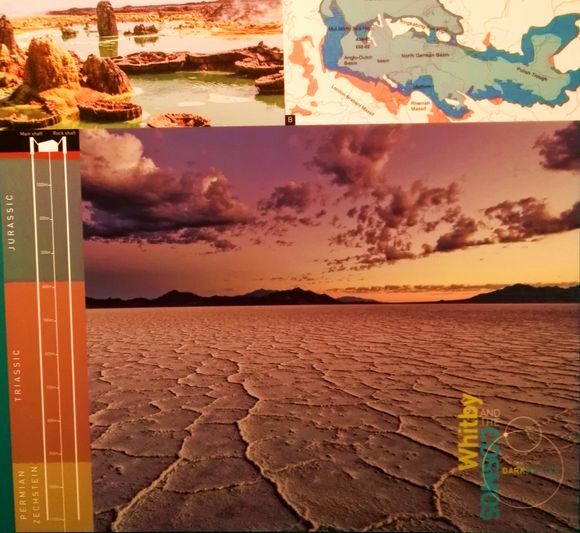 Top: 256-300m years ago, Boulby was close to the Zechstein Sea in the super-continent of Pangea. N. Europe lay in the tropical belt and the sea went through repeated cycles of evaporation and flooding. Bottom: Rocks mined at Boulby: Sylvinite/Potash (left); Halite/Rock salt (middle); Polyhalite (right). Like Boulby, this is around a mile underground. Unlike Boulby, which after the 2009 economic crash, couldn’t secure funding for a Zeplin upgrade ie more liquid xenon (research always the first to suffer in the UK) Sanford seems to have had no such problem and have married together ideas and concepts used in Zeplin with their own. 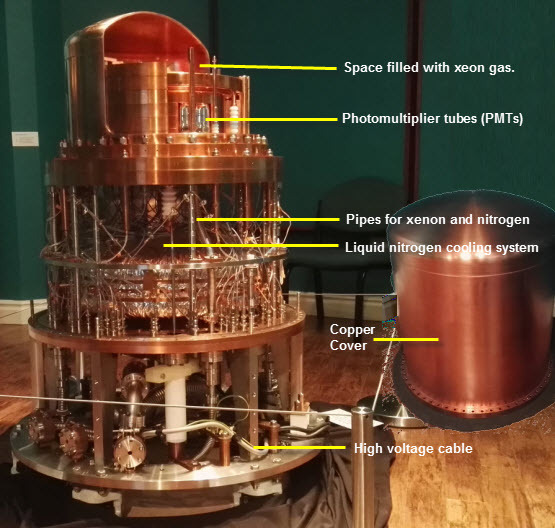 Work on building the equipment for an experiment called LUX–ZEPLIN has already commenced, which according to Prof Araujo will try to detect particles of dark matter as soon as 2020. It seems the key in detecting WIMPS is much greater sensitivity of equipment, which also means larger quantities of liquid xenon, and that means deeper pockets. So, the hunt goes on, but hopefully in the next 3 or 4 years the detection of WIMPS will verify that dark matter is real, and that the greater than expected rotational speed of spiral galaxies is not the work of some ‘unseen hand’. Mark had a bit of a surprise at the event, more precisely, with someone who was present. More of which at our March meeting, suffice to say it’s a strange, small, world sometimes. the Solar System showing the relative movements of the sun, planets and their moons.